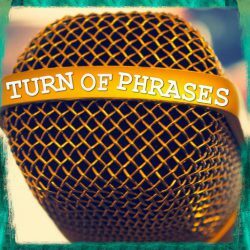 TURN OF PHRASES – A podcast about turning phrases inside out. Hello and welcome to the Turn of Phrases Podcast website. My name is Briski, and I’m a writer who loves words and stories. I also love podcasts, so I decided to make one. Here at Turn of Phrases I explore common idioms, old wives tales, superstitions, and more. As I make my way through these phrases I look for their origins and see if I can find any truth in these little tall tales. Come along with me as I turn some phrases. The Turn Of Phrases swag and gear store is open!